Everything a small business needs to invoice with the same level of professionalism as the big guys. Create, preview and send estimates, quotes and invoices on the spot via email, text or even snail mail. Tired of chasing receivables? Set Street Invoice to send out automatic statements based on aging. Fully customizable with your company logo, invoice terms, order numbers, tax rates and more. Add customers from your phone address book & always have their contact info at the touch of your finger tips. 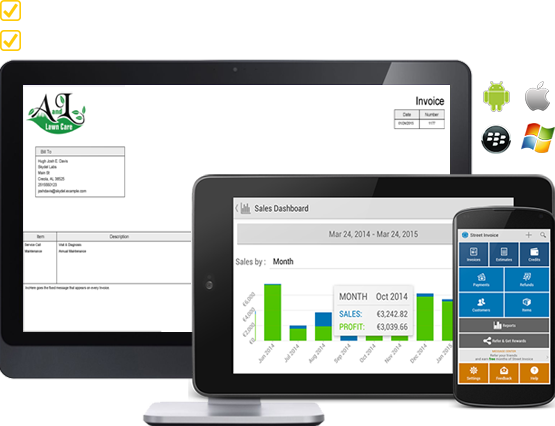 Get immediate insight into your sales, profits and receivables with customized and printable dashboards and reports. Signature capture, job & project tracking, data live across multiple devices, cloud-based technology, desktop access and more.